After a couple days of on and off rain, and cool temperatures at the Simraceway Performance Karting Center in Sonoma, the drivers and teams in the paddock for this final weekend of the 2019 Challenge of the Americas program were provided with a dry day of competition and some sunshine to decide their championships. With the titles on the line, the intensity was dialed up a little, as expected, but the class point leaders did not let off the gas in their quest to win their respective championships. California veteran Ron White put an exclamation point on his Shifter Rok title, scoring an impressive win on Sunday to wrap-up the series. 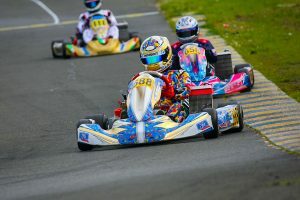 Likewise, Cooper Becklin, Derek Wang and William Ferguson all capped successful weekends, winning on Sunday to earn the titles in Senior, Masters and Junior Rok, respectively. Leading Edge Motorsports’ Danny Formal (Formula K) drew first blood in the Cameron Karting Senior Shifter Rok class, qualifying on the pole ahead of Zach Pettinicchi (Formula K) and Hunter Pickett (GFC). Point leader Ron White (CRG) timed in fourth quick, and then advanced to second in the Prefinal, which was won by Pickett. The category was stacked with all the top NorCal gearbox talent, and the main event served up a solid dose of excitement. White went quickly to the front, getting by Pickett to take a lead that he would not relinquish, winning the Challenge of the Americas title in the process. The 41-year-old put together an impressive record of performances throughout their year’s Challenge circuit, and fully leveraged his home track knowledge in Sonoma to capitalize on the opportunity. The veteran will now represent the series at this fall’s Rok Cup International Final in South Garda, Italy. Pickett was not challenged for second, as Formal retired with a broken shifter linkages, opening the door for Kol Bailey (GFC) to step up to the final position on the podium. Enzo Prevost, Callum Smith and Pettinicchi to battle it out for the remainder of the top-five, with Prevost and Smith earning the results. Smith started ninth and advanced to a strong fifth. Pickett finished second in the championship, and received an entry into the ROK the Rio event in November. Pettinicchi was third overall and was awarded an entry into this summer’s ROK California series. 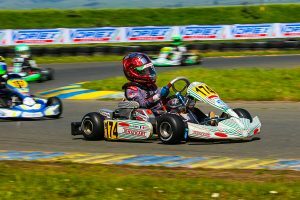 Wesley Boswell (TonyKart) was in the fight for the Ruthless Karting Senior Rok win all weekend, but he had to battle it out with several young guns. 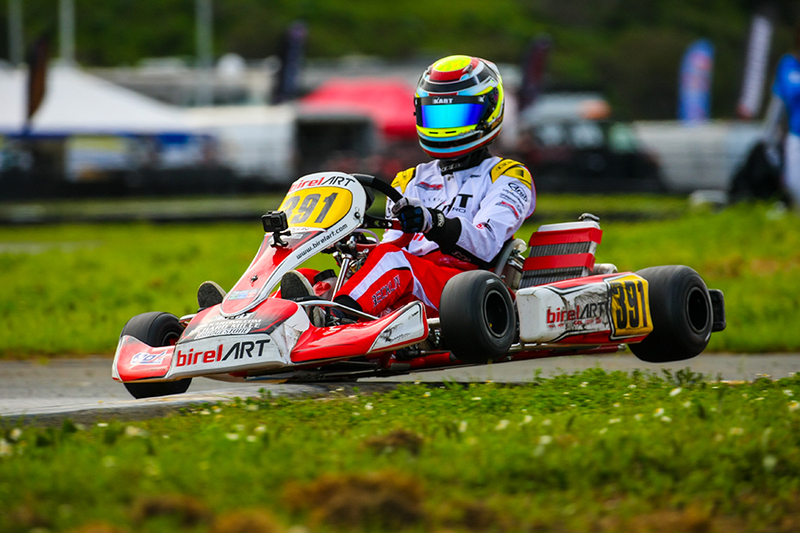 Boswell topped the morning qualifying session over Cooper Becklin (BirelART) and Bijoy Garg (Exprit), and then maintained the lead and the pole position with a decisive win in the 15-lap Prefinal over Becklin. A victory in the main event was not in the cards for Boswell, however, as Becklin rose to the occasion to secure the overall series championship outright with a scant 0.706-second triumph in the last race of the weekend. Boswell finished second. The race for the final step on the Senior Rok podium was a little chaotic as the fight came down to the final corner, with aggressive overtaking efforts shaking up the order. As the pack of karts led by Jim McKinney (Exprit) approached the final corner, Jordan Redlin (Vemme) took his shot at the podium with a move to the inside in the quick right hander that leads onto the frontstraight, and the resultant contact dropped McKinney down the order. Jake Drew (Kosmic) also left the racing surface, falling to eighth. Colby DuBato (Ricciardo) was the benefactor, slipping past the carnage to advance from sixth to third. Garg took fourth while McKinney ended up fifth in the final tally, following the avoidable contact penalties that were awarded to Redlin. Becklin’s win, coupled with Drew’s misfortune, gave the championship title to Becklin by 63 points. Becklin will head to the Rok Cup International Final in Italy, while Drew was awarded with an entry to the ROK the Rio in November. Derek Wang’s dominant weekend performance earned him his first Challenge of the Americas Master Rok championship. Wang came into the finale in a tight battle with Billy Cleavelin for the crown, having not yet scored a win in the opening four races. 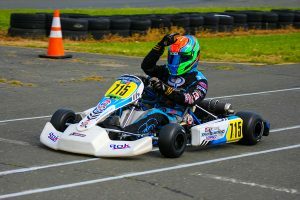 The FA Kart driver ended that drought on Saturday, scoring the victory, and he then backed it up on Sunday with a sweep of the sessions, including the fast lap bonus in the final. All told, Wang out-scored Cleavelin 235-196 in Sonoma to score the championship by a slim 20-point margin, earning the ticket to race in Italy. In the Vemme Kart Masters Rok final on Sunday, Wang quickly jetted out to the lead and was never challenged, winning by 7.209 seconds, while also turning the fast lap of the race. Cleavelin put up a good fight, finishing second in the finale, and he was joined on the podium by Rob Kozakowski. David Pergande (Vemme) and John Breidinger were just a second behind Kozakowski to complete the top-five. CRG pilot Rod Clinard lit things up in APM Racing Shifter Masters Rok in Sunday, qualifying on the pole ahead of Patrick O’Neill (CRG) and Kalvin Chen (COMPKART), but an errant water hose took the Texan out of the Prefinal on lap 10. O’Neill took the lead after Clinard’s departure and held the top spot until Ben Schermerhorn (BirelART) made his move and advanced to P1 in the late going to win. Having qualified fourth in the morning, Schermerhorn was dialing things in and hit it perfect for the 22-lap final, leading through to the checkered flag to earn his first COTA victory. O’Neill finished second while Clinard drove up from the tail of the field to finish third, earning the class championship and a trip to the Rok Cup International Final in Italy. William Ferguson (Exprit) was the top dog in EsTeam Racing Junior Rok, winning all three official sessions on Sunday. After qualifying on pole to begin the day, he won the Prefinal over Macy Williams (FA) but received a 10-second penalty for exceeding track limits in Tic-Tac-Toe, which dropped him to second. In the final, Ferguson went immediately to the lead and was not challenged, pulling out to a 9.141-second victory. Ethan Ho (RedSpeed), Macy Williams and Nolan Siegel (Exprit) battled for the final steps on the podium all race, with Ho and Williams swapping second on multiple occasions. Ho eventually secured the spot and he and Williams finished second and third, respectively. Siegel was fourth, while Liam Letzsche (FA) capped the top-five. With the drops factored in, Ferguson narrowly edged Ho for the series championship by just 14 points. Like Derek Wang in Masters Rok, it was Ferguson’s strong weekend-long performance in Sonoma that sealed the deal, and locked in his ticket to the Rok Cup International Final. Three different drivers took turns up top in Forward Direction Motorsports 100cc Senior. Cooper Becklin (BirelART) topped qualifying, but it was Jackson Dunn (COMPKART) who took the Prefinal victory after Becklin went off on the opening lap and spent the rest of the race in recovery mode. In the final, Dunn led the first lap but Colby DuBato (Ricciardo) was quickly to the point and he would run off to 6.115-second win over Josh Weis. Dunn finished third. Becklin was late to the grid and was working his way back into the fight when he retired early. With his win, DuBato earned the championship and an entry ticket to the ROK the Rio event in Las Vegas in November. Dunn was second, taking home an entry into a 2019 ROK California event of his choice. Third-place points finisher Cooper Becklin won a set of Bridgestone tires and a can of VP Fuel. 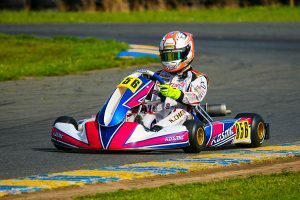 Kalvin Chen (Kosmic) continued his control of the Acceleration Kart Racing 100cc Masters class in Sonoma on Sunday, topping all three sessions. EKN’s Rob Howden (BirelART) was second in the timed session. Taking advantage of the chaos at the start of the Prefinal, Howden led the first three laps before Chen made an inside move into turn one to take back the lead. Howden was able to hang with Chen for the remainder of the 15-lap race, ending up just a second back at the line. In the final, Howden again emerged with the lead but that lasted only a lap, as Chen slipped past again and then pulled away to a comfortable lead. Howden took second ahead of local driver Craig Yeske (CRG), who joined in on the Sunday fun. Jimmy Gregory (K&K) finished fourth, scoring the class championship in the process, winning an entry into the ROK the Rio event. 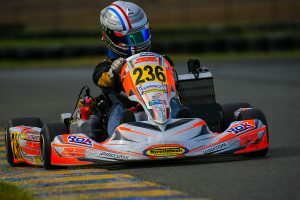 Enzo Deligny (TonyKart) and Logan Toke (TopKart) have battled for the top spot throughout the 2019 Challenge of the Americas series. They had each won a race at the first two stops, and this continued in Sonoma, with Toke winning on Saturday and Deligny standing on top of the podium on Sunday. Deligny paced all three sessions on Sunday to score the race win and the title by just five points, the closest margin this year. 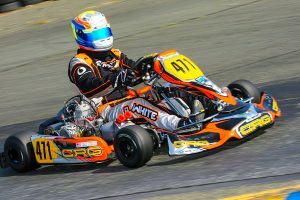 Toke was just over a half-second back to finish second on Sunday, while Anthony White (CRG) earned his fifth podium of the year to secure third in the final standings, winning an entry into a ROK California event. Deligny will be part of the COTA line-up at the Rok Cup International Final, and Toke will receive the entry to the ROK the Rio. Four drivers lined up for Empire Karts Micro Rok. Saturday winner Filippo Sala (Vemme) was quickest in qualifying but was DQ’d in the Prefinal for clutch stall speed. Zachary Walrod took the win and then ran away to the main event victory after Sala retired on lap nine with an mechanical issue. Gage Jarvis finished second and Sydney Cassels was on the podium in third. Sala’s performances throughout the series were enough to win him the Micro Rok title and a ticket into the ROK the Rio race in Vegas. Jarvis finished second in the standings to win a ROK California entry, while Cassels was third and took home a set of Bridgestone tires and a can of VP fuel. With Sunday’s racing complete, the 2019 Challenge of the Americas is now in the history books. As promoter Andy Seesemann noted at the driver’s meeting, the program has enjoyed steady growth since adopting the ROK Cup program after years as an official Rotax winter series. The 100cc Senior and Masters class replaced the Briggs 206 offering from 2019 and enjoyed decent numbers to start, and the Rok Shifter categories are most definitely strong. 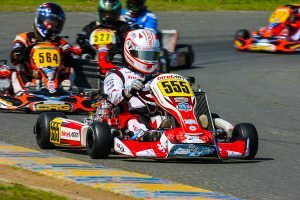 With the growth of the ROK program in both SoCal and NorCal, and the introduction of the four-race ROK California series, the future looks bright for increased participation in 2020.